After the huge success of Infibeam Pi, Infibeam launches Pi2 the next version of the Pi. 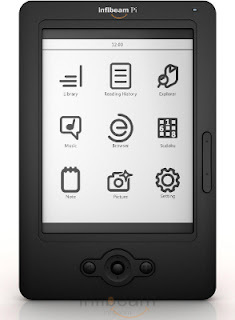 Infibeam Pi2 is a portable reading device which allows users to read ebooks, browse the internet and play games. Infibeam Pi2 comes with a touch screen which provides users with the ability to navigate easily and has wi-fi connectivity which allows users to download content from the internet and read it on Infibeam. Infibeam Pi2 can read pdf, word and other formats of books, presentations, magazines and journals. Pi2 also supports 15 languages, can store ebooks in its 2GB internal memory and supports memory cards upto 32GB. Commenting on the latest launch, Mr. Vishal Mehta, Founder Infibeam.com said, "The Pi2 is a new addition to our eBook reader family. The Pi was successful with Indian readers and to satisfy their need for internet connectivity, we have introduced Infibeam Pi2". He added, "We had promised readers that downloading newspapers, fiction and textbooks via the internet will soon be a reality. Infibeam Pi2 aims to do just that and more." Infibeam Pi2 is a sleek and lightweight eBook reader. With a thickness of mere 10mm, the eBook reader looks stylish and is every book reader's dream. The 6-inch wide display and 8 levels of gray scale is extremely eye friendly. The Infibeam Pi2 has an intuitive touch screen, one of the easiest interfaces available. It supports 15 Indian languages including Sanskrit and Hindi. Infibeam Pi2 offers enhanced storage with the 128MB RAM, 2GB internal memory and SD card slot that supports up to 32G. Infibeam Pi2 operates on the Linux operating system. That is not all; Infibeam Pi2 offers the option to create music library and readers may listen to their favorite music on the go. Infibeam Pi2 comes with a browser that uses the internal Wi-Fi to connect to Infibeam and download ebooks, eMagazines, eNewspapers. This is only the beginning, as Infibeam Pi2 will enthrall readers, and entice Infibeam to bring out better and upgraded versions of India's only eBook reader.